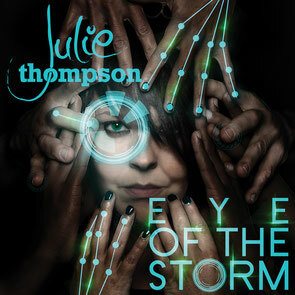 Since her simultaneous debut/breakthrough alongside James Holden on ‘Nothing’, Julie Thompson has continued to do well… she’s been the voice/front-woman on hits from a wide range of producers, Tiësto, the Freemasons, Sean Tyas and the Freestylers to name but a few. Through tracks like ‘My Enemy’, ‘No Frontiers’ and ‘Let Go’ she’s also became the vocal go-to-girl for Finnish duo Super8 & Tab. Bringing her lyricism and vocals to the broadest possible spectrum of electronic dance music, Julie’s catalogue has come to encompass house, trance, progressive, dubstep, breakbeat, electro and much in between. Over 11 tracks, written and recorded over the last 20 months, the British singer has crafted a decent follow-up. ‘Eye Of The Storm’ has all the expressive introspection, from-the-soul vocals, story-tell lyrics and absorbing metaphor of a singer without contemporary, all approached with her no-stylistic-borders methodology. The overture of ‘New Day’, the floor-engagement of Super8 & Tab collab ‘Your Secret’s Safe’ and ‘We Are Stars’ unchecked uplift collectively summon the ‘Eye’s pace. Expanding its style, ‘Fortune Smiles’ conveys atmospherically bleached out synths and speedily paced, running riffs, which are played off against Julie’s lyrics. ‘My Paradise’ meanwhile brings EDM dimensions to the album, while ‘Loved’ front-ends with bleepy echo-ism, pays off with a leadline and is bound together by her vocal optimism. With contrast, the album transcends again with ‘Dive’ and the slo-mo breaks of ‘Freeze’. At the midpoint, alongside London-based twosome Pyramid, Julie brings downtempo dubstep, breakbeat and electro aspects to the album. Deeper, more trance-progressive textures come virtue of ‘Natural’ with Ad Brown, while the Andy Duguid-produced ‘Skin & Bones’ induces a cooler edged sound. Hi would you mind letting me know which webhost you're utilizing? I've loaded your blog in 3 different web browsers and I must say this blog loads a lot quicker then most. Can you suggest a good hosting provider at a fair price? Thanks a lot, I appreciate it!